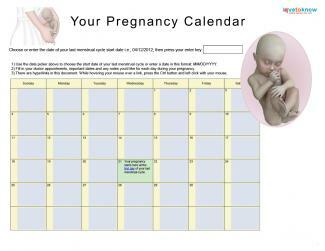 Despite being technically full term, your baby is still growing and changing inside your womb. These last couple of weeks of your pregnancy can seem long, but you'll be holding your little one very soon. At 38 weeks, the average baby is about 19.5 inches long and just under seven pounds; however, at this point in development, babies can vary significantly in size. During your prenatal visit, your doctor may be able to give you a rough estimate of your baby's size. The Mayo Clinic also reports that at 38 weeks, your baby has changed in a few important ways. You may have noticed that when you brush the palm of a newborn's hand, the baby will grasp your finger firmly in his fist. This reflex has developed by week 38 and will continue until your little one is five or six months old. Your baby started growing toenails a few weeks back, and now those nails have reached the ends of his cute little piggies. You'll be able to count those toes soon enough, but for now, you can imagine the protective nails that cover them. Your baby's brain weighs about 14 ounces by this point in his development, which means it accounts for about 12.5% of your little one's total weight. After birth, your baby's brain will continue growing and developing rapidly as he takes in all the experiences that come with life in the outside world. The lanugo, or downy hair, that covers your baby's body is almost gone by week 38. Your little one may still have traces of this hair on his skin at birth, but most of the lanugo will have disappeared. Not a lot is changing in your body at this point in the pregnancy. According to the American Pregnancy Association, you may not notice an increase in your size or weight, since the volume of amniotic fluid is decreasing. However, it's common to experience swollen feet or ankles around week 38. You may also notice that your rings are tighter than normal. While some swelling can be attributed to normal fluctuations in pregnancy hormones, excessive swelling in your hands, face, feet, or ankles can be a sign of preeclampsia. Also known as pregnancy-induced hypertension or toxemia, this is a serious condition that requires close medical supervision. Contact your healthcare provider immediately if you notice unusual swelling accompanied by visual disturbances, an intense headache, abdominal pain, or fever. Your baby should have settled into a head first, or vertex, position by pregnancy week 38. However, about three percent of full term babies are still in a breech presentation by this point in the pregnancy. If your health practitioner is concerned about a breech birth, he will perform an ultrasound to determine exactly how your baby is positioned. There are many varieties of breech presentations. A baby born in a frank breech comes out buttocks first with his legs straight up and flat against the face. If your baby is in a traverse position, he is lying sideways in the uterus. If one or both of your baby's legs are pointing down, he is in a footling breech presentation. If your baby is in a breech presentation, your physician may try to convince him to change positions through external cephalic version. This procedure involves manually manipulating the abdomen gently to shift the fetus into the correct position. It has a 58% percent success rate. If your baby has already dropped down into your pelvis in preparation for birth, you may not be a candidate for this type of procedure. However, if your doctor chooses to perform an external cephalic version and is able to change your baby's position at this point in your pregnancy, there is only a small chance that your baby will shift back to breech position before delivery. Some physicians routinely order cesarean births for babies in a breech presentation. However, others will allow the mother to attempt a vaginal birth if there are no complicating factors. If you are concerned about the possible risks associated with a cesarean birth, ask your physician if he will allow a trial of vaginal labor. Your baby is almost here! Keep taking great care of yourself and try to get as much rest as possible. Your body is working hard to prepare for delivery day.